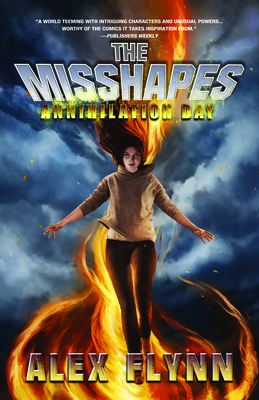 Sarah Robertson's less-than-super powers relegated her to a group of misfit heroes known as 'Misshapes', who banded together to save their town of Doolittle Falls. Now, after an exciting summer fighting storms, Sarah returns home a different girl in the second book in this heroic series. Doolittle Falls is in chaos, and with the election of a new President, things take a dark turn. Heroes are given extraordinary freedom with results that are less than super - and certain people have a vendetta against Sarah's mom, aka Lady Oblivion, and the entire Robertson family. Johnny and Alice are too preoccupied with their band to help, Freedom Boy is off shooting a movie, and Butters is in a Karaoke battle of epic proportions, so Sarah takes the investigation into her own hands, and must uncover the true reason behind her mother's turn from Hero to villain. Soon Sarah discovers a devastating secret that could topple the nation, and if Sarah and the rest of the Misshapes don't stop this looming threat, the world as they know it faces annihilation. The adventure continues in one of the coolest new adventures series for Young Readers, The Misshapes leap off the page like your favorite comics. Alex Flynn is the pseudonym for the writing team of Stuart Sherman and Elisabeth Donnelly. They met at a clandestine book club in Boston, where they broke into a fortified tower in order to discuss literature. They like garrulous Irish writers, Pushing Daisies, Axe Cop, and anything involving The Tick. Their secret lair is currently in a hollowed-out volcano in Brooklyn. In addition to cowriting The Misshapes, Donnelly is a cultural journalist who has written for The New York Times Magazine, the Boston Globe, the Los Angeles Times, The Paris Review Daily, GQ, and many others. Sherman is a bioethicist, health policy analyst, and a former contestant on the game show Who Wants to Be a Millionaire?